> I came home late yesterday. My flight was very delayed out from Belgrade and than we had to circle around London for a hour before we finally could land….frustrating?..yes. 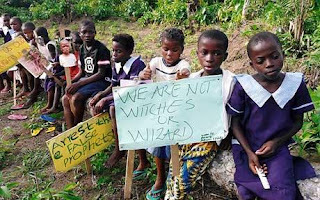 Once home we watched a BBC documentary about child witches in Nigeria. I saw the first programme and this was a follow up. Some Churches and self proclaimed apostles in Nigeria are teaching about demons and witchcraft in churches and conferences where they accuse children of being servants of the devil full of witchcraft bringing curses to their families. As a result of this parents are rejecting their children and chase them away and in many cases kill them. Torture,murder and the most terrible atrocities are being done to those kids in the name of the church. Churches that call them selves pentacostal churches….. I am very upset to see how leaders are misusing faith and spirituality in such a disgusting way. Unfortunately also here in Europe crazy and stupid things are being done in the name of church and religion. Lets give Jesus to this hurting World. Lets fight against corrupt religious institutions with its false leaders.